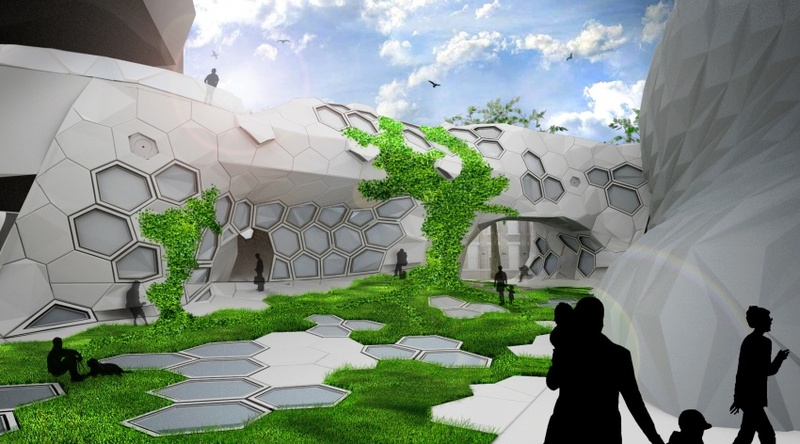 HexScape consists of an intelligent network of hexagonal modules with a multitude of functions. Each module is loadbearing and communicates with one another to adapt to occurring changes. For example: A group of people enter the lecture hall; the floor accommodates an auditorium-like seating arrangement and the light wells above dim the natural lighting. 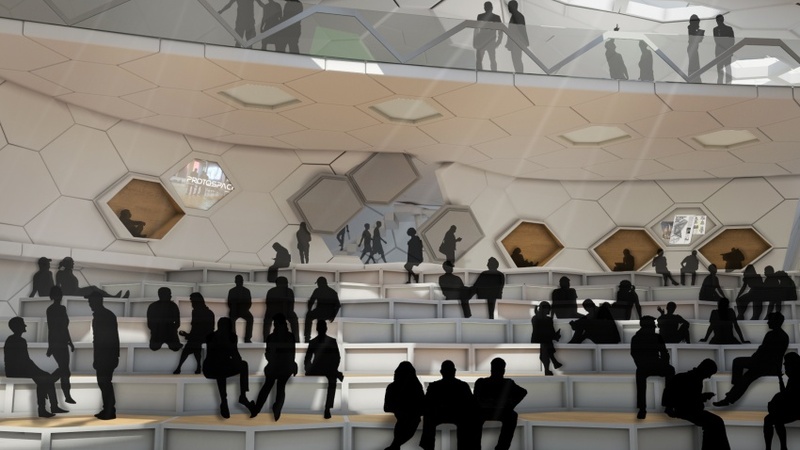 The hexagonal module HexScape’s underbelly functions as a Conference room, a lecture hall to alleviate the nearby campus as well as provide such an accommodation for other users. When there’s no lecture scheduled, the room opens up through the light wells connecting to the public space above and functions as a flexible workspace for the students of the faculty of Architecture. 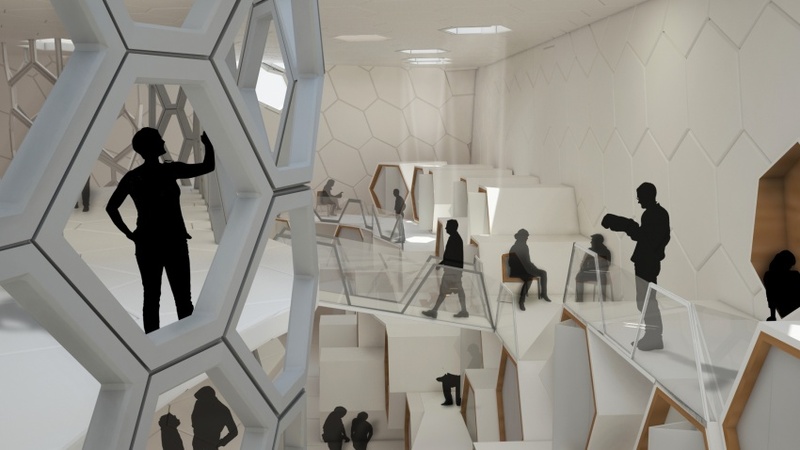 Hexscape provides nightly accommodations for the plot in the form of an underground and above ground Capsule Hotel as well as it contains a small dining venue, a Bistro for its users. 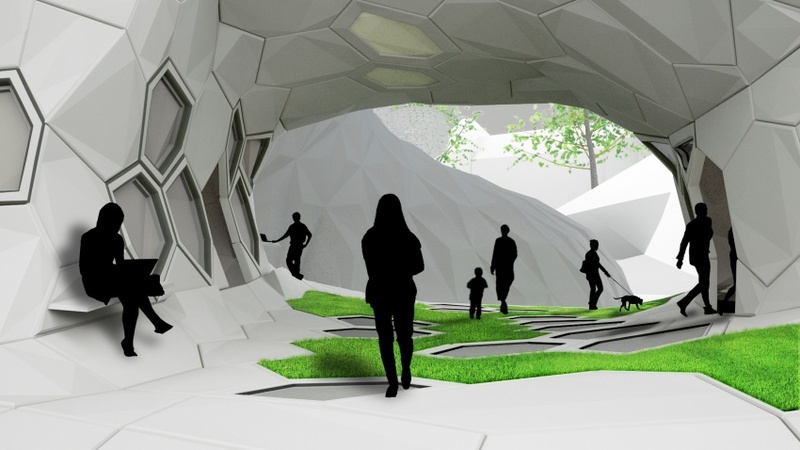 Furthermore, the project focuses on interaction on a smaller scale; our neighbours. Several connections can be found based on the core function; the flexible conference and work space. The remaining functions that are integrated, such as the Capsule Hotel and Bistro, stem from logical links with the neighbouring plots. An active synergy exists between the functions of the neighbouring groups on several levels, both inside as outside. As stated before, central to the project is the concept of modularity. The main aim and focus was to create a highly flexible building that was able to interact on multiple levels with its climatic environment, immediate landscape and its users. 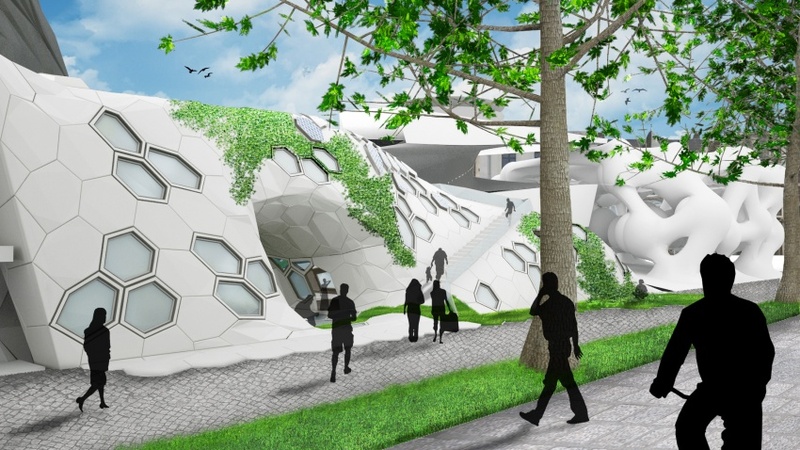 Especially because these three elements are constantly in flux, a building; both its softscape and hardscape, has to respond to these changes in an interactive manner. Apart from the building on a modular scale, we are convinced that the building completely interacts with its open spaces as these have shaped the formal expression of the building. In this way the open space is not merely a detached addition - on the contrary - the open space becomes an integrated entity that is put to use in its full potential. Approaching the modular landscape walking from the faculty of Architecture, the street folds and flows into the landscape, people traversing through and across it. Two entry points appear as you walk towards the main public square of the plot. The lightwells create a visual interaction between the public space and the capsule hotel beneath. A view from the main square, looking back towards the faculty of Architecture. The conference room filling up as a lecture is about to start, light still radiating from the overhead lightwells. Some students leisurely reading in one of the few comfy wall booths as others seat themselves for the upcoming lecture. A look at the Capsule Hotel from a stairwell leading up to ground level and up. This page was last modified on 30 January 2014, at 15:31.